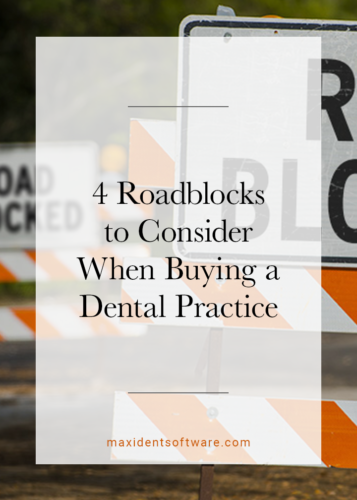 Are you ready to buy your first dental practice? Do you know everything you need to know and then some? Or maybe you’re moving, or you want to increase your patient base, or you want to improve your existing practice.7 Whatever the case, the first step to buying a dental practice is always research. In your research, you are going to come up against roadblocks. As always, they are a part of any big decision you make, and it’s the discovery of these roadblocks that is just as important in the buying process as overcoming them. Below are four you might come up against, moving forward. Some owners are just too emotionally invested in their practice to let it go, or they are not ready to retire. Either way, it does not bode well for you and could cause you unnecessary heartache. In some cases, the owner wants to be employed for an indefinite amount of time. If the owner sticks around for a few months, that’s fine and actually helps to smooth the transition.1 But when that few months starts to stretch into a few years or even longer, it is unreasonable and frankly unfair to you. Always ask the seller questions to make sure that they and you are on the same page. It is a good idea to get professionals involved in the purchase. Perhaps you need an accountant to help you figure out your finances.5 Or maybe you could use a lawyer or another kind of specialist to help you make the right decision. But by “specialist,” I don’t mean someone who says they’re a “specialist” but have no credentials or are just a friend you can’t turn down. Make sure your professionals are professional with expertise in the field. Too many things can go wrong without a specialist on board, including non-specialists dragging the issues out longer and costing you more. One of the worst mistakes anyone can make before buying anything is neglecting to do the research involved. What are you buying exactly? Have you taken a good long look at the practice? Factor in everything when buying the practice from purchasing new equipment and redecorating to rebranding. If you don’t do the research, who knows what you’re really getting and how much money you will lose in the process of bringing it up to your standards? Important Questions to Ask When Buying a Practice? What are your plans after the sale? Do you want to continue to practice dentistry? If yes, in what capacity? If there was a way for us both to have incentives to make the deal work, would you be willing to delay the partnership sale slightly to ensure that our works styles and skills are a good fit? Do you know what you’re actually buying? Do the patients actually exist? How many are active? What equipment is staying and what equipment isn’t? What is the reputation of the clinic?